This is leaked information from China not from Volvo Car Corporation. Volvo has announced that the Volvo S90 sedan will debut on the Detroit Auto Show in January. Time thus for the best look ever at the S90 1:43 scale model that leaked in China. 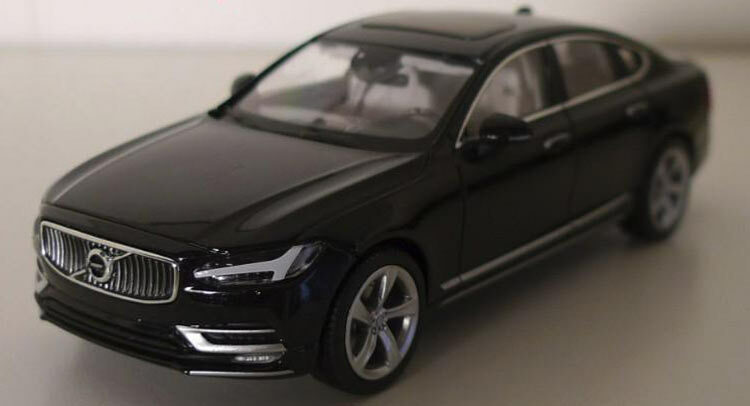 This black car is one of two 1:43 Volvo S90 sedans that went missing from the toy factory after the initial disappearance of 20 cars. The other one is a ‘Liquid Blue’ example. At the same time two Volvo V90 wagons went missing as well, one in black and one in blue. Volvo ordered 2000 models of the S90 and 2000 of the V90 from the French model maker Norev, who outsourced the job to a Chinese toy maker, where staff got a bit too excited. The remaining cars have likely been shipped to Sweden, because we haven’t seen any more cars in the wild. The S90 seems to be a beautiful car, in four-door coupe style with a short rear end. Window frames in thick chrome, more chrome on the low end of the doors, mirrors, and a massive amount on the grille. The S90 is the successor of the long-running Volvo S80. It will be launched on international markets in the first half of 2016, to be followed by the V90 wagon in late 2016 or early 2017. It will be manufactured in Sweden and later in its life in China as well. T5: 2.0 turbo: 257nm and 350nm. T6: 2.0 turbo + supercharger: 325hp and 400nm. T8: Drive-E hybrid. 2.0 turbo + supercharger and a 80hp electric motor. Total: 405hp and 640nm. D4 diesel: 2.0 turbo: 193hp and 400nm. A rather small sunroof and a shark fin antenna. Interior very similar to the XC90. White leather seats and light colored wood. Bench in the back should be big enough for three. Captain seats will likely be an option, especially for the Chinese market. Debut in China is scheduled for the Beijing Auto Show in April next year. Steering wheel with a wood rim on top. There seems to be a head-up display (HUD) fitted on the dash in front of the steering wheel behind the windscreen. Mirrors are fitted on the door. 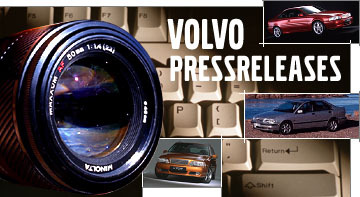 These are two official photos that Volvo has released.